PHOTO:U.S. Vice President Mike Pence, center, addresses a meeting on Venezuela in the United Nations Security Council at U.N. headquarters, April 10, 2019. UNITED NATIONS — U.S. Vice President Mike Pence called on the United Nations on Wednesday to “stand up for democracy” and recognize Venezuelan opposition leader Juan Guaido as that country’s legitimate leader. 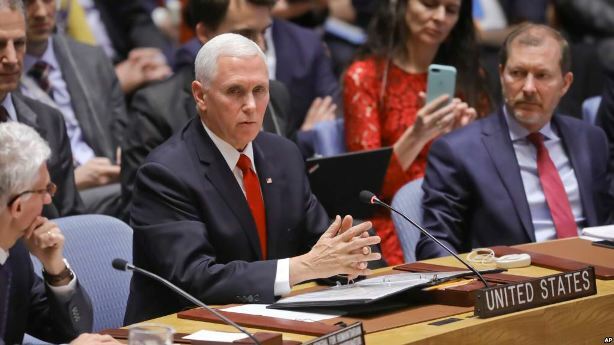 “While other international bodies have acted, the United Nations and this Security Council have refused to act,” Pence told a meeting of the U.N. Security Council called by the United States. 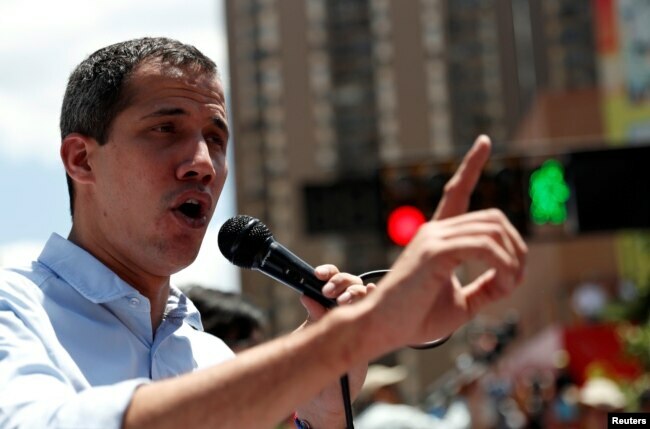 FILE – Venezuelan opposition leader Juan Guaido, whom many nations have recognized as the country’s rightful interim ruler, attends a rally against Venezuelan President Nicolas Maduro’s government in Caracas, April 6, 2019. Pence said the United States is working on a U.N. resolution to recognize the legitimacy of the government of Guaido and urged the international community to support it. 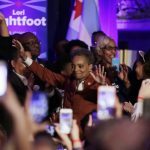 “Stand with the Venezuelan people as they rise up to restore freedom, democracy and libertad to their nation,” he said, using the Spanish word for freedom. 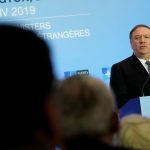 It was not immediately clear whether the U.S. is seeking to accomplish this in the Security Council — where Russia would certainly veto any such measure — or in the General Assembly, where all nations have a vote. Under U.N. procedures, government delegations are accredited through the organization’s Credentials Committee. If a majority of the committee’s nine members votes to revoke the credentials of the delegation of President Nicolas Maduro, then the matter would move to the General Assembly where a simple majority vote would be required to affirm their decision. The U.S. could also circumvent the committee and bring a resolution directly to the General Assembly for a vote. So far, 54 nations have joined Washington in recognizing Guaido’s government after he declared himself interim president earlier this year. The U.N. has 193 member states, and it is not clear how many would support such a resolution. Many states are hesitant to take measures interfering in the internal affairs of other countries, lest they find themselves on the receiving end of such measures in the future. 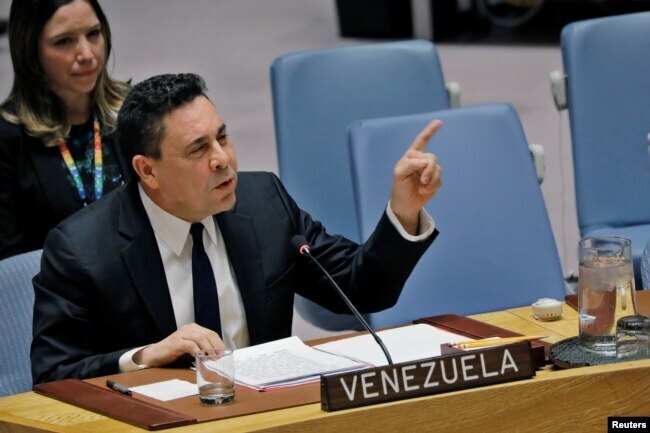 FILE – Venezuelan Ambassador to the United Nations Samuel Moncada speaks during a meeting of the U.N. Security Council on Venezuela’s electoral and humanitarian problems at U.N. headquarters in New York, Feb. 28, 2019. Moncada reiterated that Washington’s attempt to send humanitarian assistance to his country is a pretext for a military invasion and called on the United States to lift its sanctions if it really cares about the Venezuelan people. Pence announced an additional $60 million in humanitarian assistance to support Venezuelans and the host communities that have taken them in. That is in addition the $200 million the U.S. has already allocated in aid. U.N. humanitarian chief Mark Lowcock told council members that a quarter of Venezuela’s population — some 7 million people — are in need of assistance, from food to medical care to clean water and sanitation. The United Nations has appealed for $109 million for this year to assist people inside Venezuela, but has so far received $49.1 million. An estimated 3.7 million people have fled the country, the overwhelming majority since 2015. Those are the official U.N. estimates, but the U.N. refugee agency representative for Venezuelan refugees and migrants, Eduardo Stein, told the council that the number would “go well above the 4 million mark” if people who have left through irregular means also are counted.